This hard disk drivers are intended mostly for newer storage devices and adapters - like Satandisk, UltraSatan, IDE hard disks or Compact Flash cards. May work with older hard drives too, but it is not guaranteed. Supported is SCSI via ICD or Mega STE internal adapter. Concept is: simple usage, fast work, not one universal driver for all HW, but separated driver installers for diverse adapters, storage - like ACSI, IDE ... It gives less problems by install and lower RAM usage. All SW is written in pure ASM, what means fast work too. Important part of package is partitioner SW - partitioning storage media is first step in usage. Select C (or A or B), then Options, type in drive letter (D-P), give name, Install. You need to repeat procedure for all partitions. Save Desktop when all done. SW for writing image files on Flash cards in Windows, via USB card reader: Drive Imager . Of course may do images of cards, and there is file transfer too. Added little guide for proper writing on cards under latest Windows versions. Oktober 2014 updates: Correct capacity displaying for very large medias - up to 9.9 TB. Support for Uwe S. Hddriver type TOS/DOS compatible partitions. Better editing of FAT32 partitions in partitioner. Windows LFN filtering - works on TOS 1.00, 1.02, 1.04, 1.06, 1.62, 2.06, 3.06 - UK,US,DE,FR . Access to AHDI partitioned, Uwe S. Hddriver type Win/TOS partitoned medias. Works on ST, STE, Mega ST, Mega STE, TT . Works on ST, STE, Mega ST, Mega STE - if equipped with regular IDE IF . Falcon . Price is 10 Euros for any version, or for multiple versions (all cost total 10 Euros too). Just describe your HW, and I will post you proper versions. All drivers have 2 execs: installable for autoboot, and direct runnable. And there is partitioner SW too, of course. Preferred payment is via PayPal. Contact via e-mail: petari@8bitchip.info . 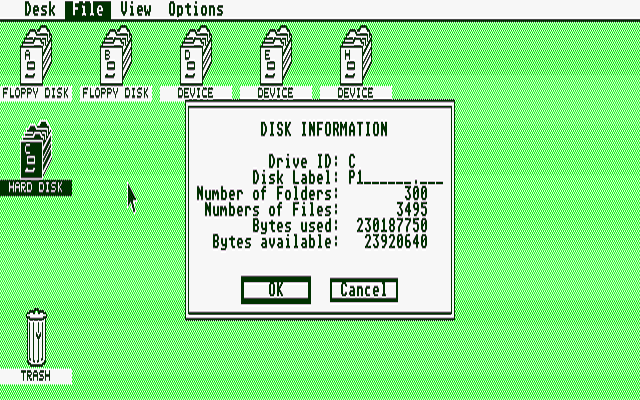 There are 2 main types of partitioning by Atari ST hard disks: AHDI and DOS type partitioning. In fact, they differ very little, and no any support for AHDI type partitioning in TOS. It is all on driver SW. More relevant is FAT16 partition's type, and since it is handled via TOS, better said GEMDOS, it is only little DOS FAT16 type compatible - only for partitions smaller than 32MB. All above, called BigDOS is not compatible, because of different parameters (logical sector size, cluster sizes). Because we want our Atari medias (Flash cards in first place) to be easily accessible on some PC, MAC, TOS/DOS compatible partitioning is welcome. Partitioner creates all FAT16 partitions TOS/DOS compatible. It can create FAT32 too, but it is usable only with Mint and Magic. And of course, FAT16 has some limits here, depending of TOS version: TOS 1.02 : max part. suze is 256MB. (TOS 1.00 is not supported). TOS 1.04-3.06 : max part. size is 512MB. Falcon TOS supports max 1GB partitions, but for now my partitioner can create max 512MB on Falcon too. And 1GB is not recommended anyway - larger sectors, more wasted space. 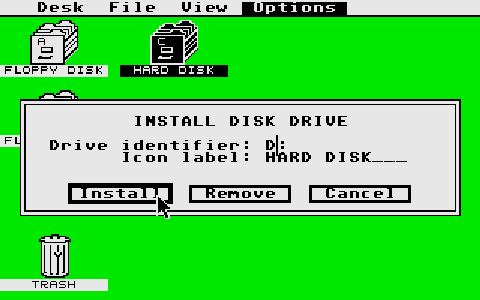 Concept, background, history: I started with Atari hard disk driver SW programming somewhere around 1996. Main reason was that most of existing drivers in that time worked not well with IDE hard disks - and I had then only IDE hard disks - Conner of 80MB, IBM drives of 160MB and similar. And I went immediately on DOS compatible solution. It was not hard, because used only small FAT16 partitions, below 32MB size, which are compatible with TOS. Driver self used CHS addressing (max 512 MB accessible), and it was OK for existing drives. Unlike usual solutions for Atari, I place autoboot loader not on first partition (something like hddr.sys), but on free space after master boot record. There is normally 30KB space, enough for any driver version (what may be even packed) . Beside beeing simpler, faster, it offers selection of active C partition during autoboot - user can select which of physical partitions D-P to swap with physical C, so it will become current C (while physical C will become current D-P (what is selected) ). Since on C are placed all AUTO start programs, drivers, ACCessories, Desktop.inf etc, it results in very simple environment change, by current user needs - may have setting for some work, programming, another for music, third for gaming etc. As Atari boots very fast, you can switch in couple seconds. Driver development continued with arriving of new adapters, larger drives. Especially when Flash cards arrived on market - they are ideal for our oldtimer - low power consumption, not hunderts of GBs (useless on ST), easy attaching on PC, etc. All it needed new solutions, like TOS/DOS compatble BigDOS partitions, support for new adapters and similar. Work on TT needs special care about CPU cache and Fast RAM. But some money is needed in all this - you can not develop HW driver without spending some money on equipment, storage devices and similar.